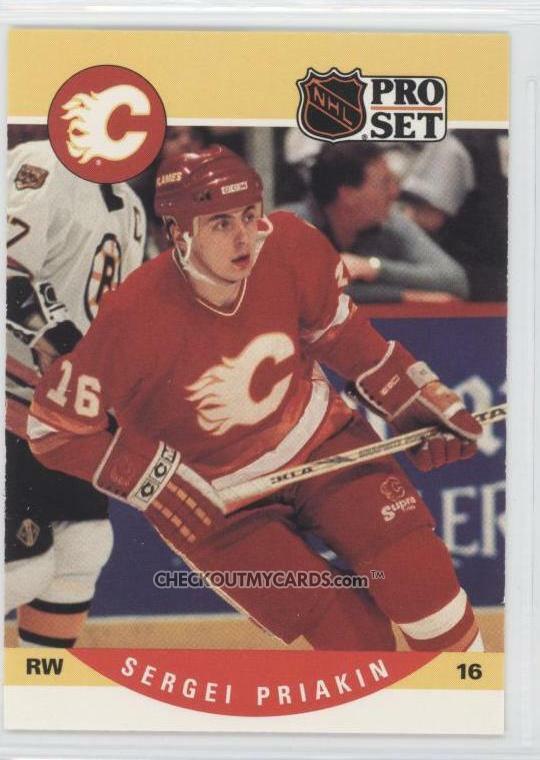 SERGEI PRIAKIN, the 25-year-old captain of the Moscow-based Soviet Wings club, made National Hockey League history when given permission by the proper authorities in the Soviet Union to join the powerful Calgary Flames, who went on that season to later lift the coveted Stanley Cup, in the spring of 1989. Soviet national team winger-to-be SERGEI PRIAKIN was but six going on seven years old at the time. Communist Party General Secretary LEONID BREZHNEV was rather busy pursing a specific foreign policy known as “Razryadka”, which was better known in the West as “Detente”. In conjunction with this aim, the Soviet Ice Hockey Federation quietly began to allow a very limited number of veteran players the unique privilidge of a season or two of play in certain, carefully selected countries. And so, a lucky handful were chosen to become, in many respects, diplomats on skates. The Union of Soviet Socialist Republics had never been “slow to capitalize on international sporting success by using its outstanding sportsmen as ‘ambassadors of good-will’, not infrequently as a ‘try-out’ for political initiatives,” wrote author JAMES RIORDAN in his book, “SPORT IN SOVIET SOCIETY : DEVELOPMENT of SPORT AND PHYSICAL EDUCATION IN THE U.S.S.R.” (1977, Cambridge University Press). And thus, although the transactions never did receive much, if any, publicity in the official Soviet press or, for that matter, anywhere else, these “Cultural Exchanges” with Western clubs approved by the government had, in fact, arrived long before the Calgary Flames even existed as a National Hockey League club. It is interesting to note that the very first Soviet ‘legionnaire’, EVGENY MAYOROV, was sent not only to neighboring Finland, but, specifically, the TUL Vehmajsten Urhejliat club of Tampere, as well. Of course, Finland and the Soviet Union had fought the Winter War (November 1939 thru March 1940), an event that resulted in the expulsion of the U.S.S.R. from the impotent and irrelevant League of Nations. This conflict was follwed by the further hostilities known as the “War of Continuation” (June 1941 thru September 1944). The net result of these two wars saw Finland, who were, as a Grand Duchy, part of the old Russian Empire from 1809 until 1917, cede significant-enough as well as strategic territory to the Soviets. Throughout the long period known as the Cold War, the official foreign policy of Finland, the so-called “Paasikivi-Kekkonen Line”, was based on strict neutrality between East and West. With this as a backdrop, the very first Soviet to play in Finland arrived in Tampere for a single, unproductive 1968/69 campaign with TUL Vehmajsten Urhejliat. Mayorov, the 1964 Olympic gold medalist whose brother, Boris, was the captain of the U.S.S.R. national team in the late 1960s, would register just two goals (with no assists) in 16 games for VehU Tampere, who were relegated at the end of their one and only season ever in the top flight of Finnish hockey. “Suomen Tyovaen Urheiluliito”, known by the accronym TUL, would be the Finnish Workers’ Sports Federation, which was founded in 1919 and has a very strong labor union background; the organization is also affiliated with the Central Organization of Finnish Trade Unions (Suomen Ammattiliittojen Keskusjarjesto or SAK) as well as the Social Democratic Party of Finland (Suomen Sosialidemokraattinen Puolue or SDP). 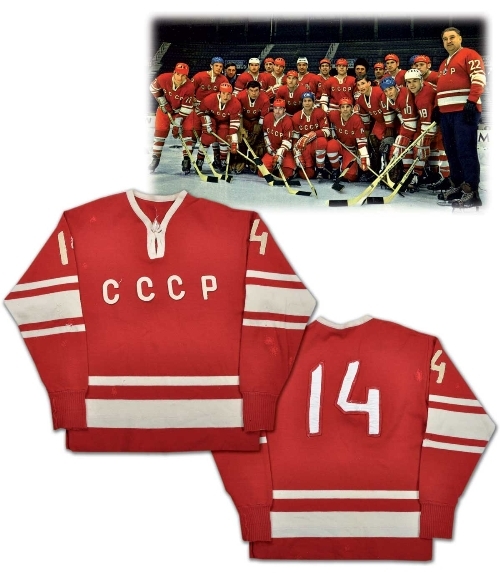 The # 14 sweater worn by Soviet Union defenseman VALERY NIKITIN of Khimik Voskresensk during the 1970 IIHF World Championships as displayed at www.classicauctions.net; the game jersey had been acquired by a Swedish dignitary at the conclusion of the tournament won by the U.S.S.R. in Stockholm. 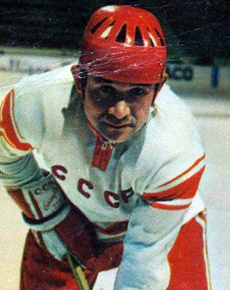 With the lone exception of VYACHESLAV STARSHINOV, the first wave of Soviet players were not of top international class. In addition to the two-time Olympic gold medalist Starshinov, only VALERY NIKITIN, VIKTOR TSYPLAKOV and VLADIMIR YURZINOV could claim IIHF World Championship medals won for the U.S.S.R. on their resume. Most of the pioneering players initially sent abroad would go on to become successful trainers in the Soviet system; both Yurzinov (Sarajevo ’84) and IGOR DIMITRIEV (Calgary ’88) were assistant coaches for title-winning squads at the Winter Games. 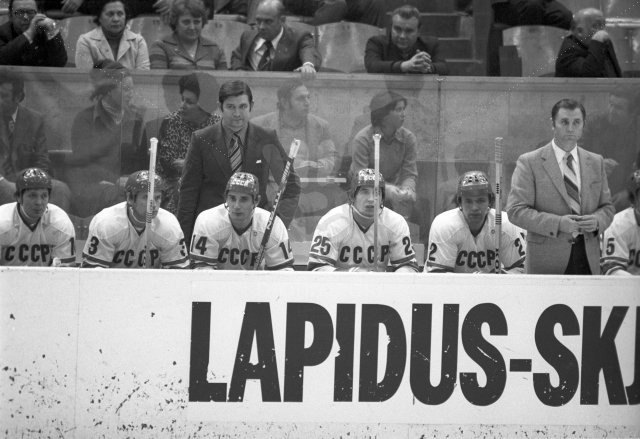 VLADIMIR YURZINOV stands behind defenseman ZINETULA BILYALETDINOV (14) of Dynamo Moscow while assisting Soviet Union national team trainer VIKTOR TIKHONOV, who is standing in front of the bench to the right of standout young defenseman VYACHESLAV FETISOV (2) of CSKA Moscow, during an early 1980s Izvestia Cup match at the Palace of Sports of the Central Lenin Stadium in the capital city of Moscow. One productive benefit of the Cultural Exchange program for the Soviet Union was the immediate acquisition of much-valued Western hard currency. VLADIMIR VASILIEV, who had been a top goal-scorer for Khimik Voskresensk and later went on to serve as trainer of the 1987 U.S.S.R. junior national team involved in the infamous PIESTANY PUNCH-UP, reported in his book that his AC Klagenfurt employers paid the Soviet Ice Hockey Federation a fee of 35,000 Austrian schillings for his services. According to Vasiliev, however, authorities in the U.S.S.R. confiscated all but five thousand of this total sum.